A society that fully deploys content commons, open data and smart media solutions in its initiatives "differs from" the current society in each of the three realms Operations, Monitoring & Evaluation and Change. 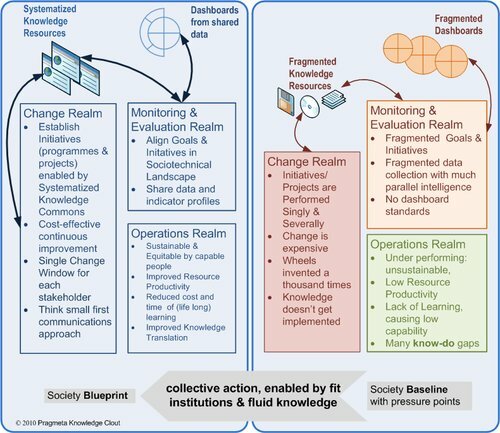 In each realm, partnerships face specific capacity and capability problems (in the contemporary society, see the right-hand side of the figure below), and specific improvement targets could be expressed (left-hand side of the figure). Solving the realm-specific problems by fit "collective and open access" institutions and by creating fluid and lean content will spur a Talent Explosion in the (sustainable) development interactions1 in each of many economic activities and functions of government in all engaged national and local constituencies, for agreed sustainable development goals and targets. Synergy by fluid, lean, engaging and open content should become effective in the partnership interactions across realms and "sector-specific" initiatives. This is explained in more detail and with several references at Collective Decision Frames (Ens Dictionary) and in the Wikiworx page about the Post 2015 Partnership Capability. the desirability of collective action. low hurdle access to open data, such as World Data Atlas (Knoema).